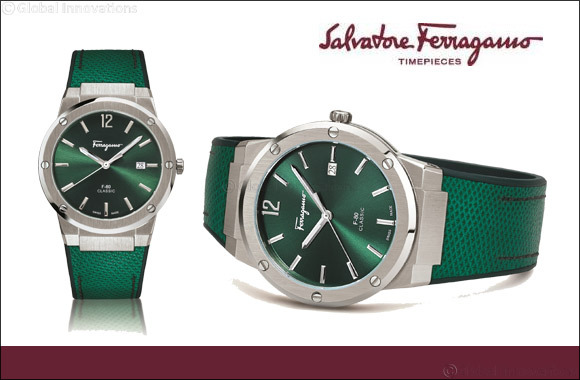 Dubai, UAE, March 12, 2019: F-80, the best-selling line from Salvatore Ferragamo Timepieces is renewed with this year’s colour: green, in a vibrant shade to highlight the luxurious athletic spirit. The steel case is slimmer and smaller than before, reflecting the latest style trends: perfectly balanced in size, the F-80 Classic fits the wrist perfectly, offering pure comfort. A sunray finish makes the dial brighter and more elegant, while the satin-polished metal surfaces reveal the painstaking precision behind its design. The case back is embellished with an engraving of Palazzo Spini Feroni, the historic headquarters of the house in Florence. The karung leather strap is backed with rubber, mirroring Salvatore Ferragamo’s iconic flair for experimentation with materials and the outstanding leather work that is part of its heritage. The F-80 Classic also comes in all blue or all black and in a timeless champagne IP case with dark brown strap. The watch will be available from April at Salvatore Ferragamo boutiques, authorised retailers and online.